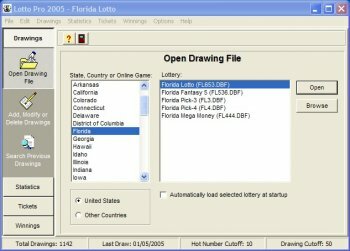 Lotto Pro works with all lottery games; Pick-3, Pick-4, Pick 5, Pick-6, Pick-7, and Keno. 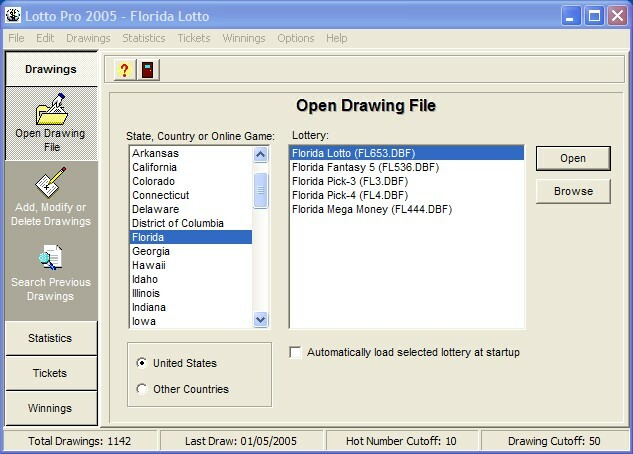 Up-to-date drawing files for all United States and Canadian lotteries. Drawing files are also included for many other countries. Drawing Files can be created for countries that are not listed. No where near as accurate as looking through chicken entrails. Rubbish. Only 5 out of the 6 numbers it gave me were correct. For the mathematically challenged, flipping a coin 10 times would statistically yield 5 heads and 5 tails, but having flipped the coin 9 times already and having had 9 heads doesn't increase your chance to get tails on the next round: it's still 50/50. Random numbers. One of the simplest programming functions. Pay money for something like this? You've got to be kidding. A four year-old could do this. Sure, it's pretty and has dynamic statistics, but how important is that when lottery is pure luck? Geared for the superstitious. Why not just have the lotto machine generate the random numbers?